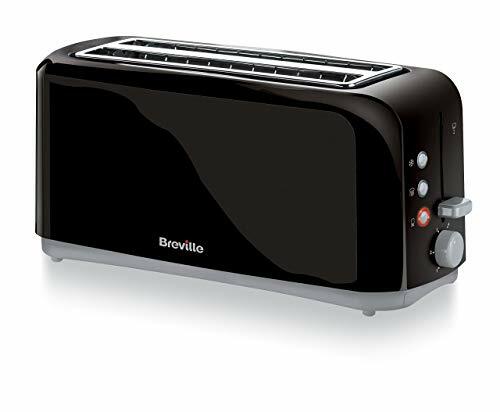 With a sleek design and gloss black finish this Breville VTT233 Black 4 Slice Toaster is packed with handy features to help create your perfect slice: Variable width slots accommodate different bread sizes, crumpets and bagels, while the high-lift facility means no more burnt fingers when removing smaller toast slices. Illumination highlights the defrost, reheat and cancel functions for quick and easy use and variable browning controls ensure every slice is toasted to your liking. Cord storage and a removable crumb tray help keep your worktop clean & tidy. 1400 watts. 4 slices. Wide slots with a variable width function. 6 toast settings. High-lift function for easy removal of smaller slices of bread. Cancel, defrost and reheat function. Cool touch. Cord storage. 1 year internal manufacturer's guarantee.